Toklo is the most independent grizzly bear, out of all the other bears. He has a little brother called Tobi who was born sick and struggles to survive. Toklo does not like Tobi because he does not do anything since he is an invalid. One day, on their way up a mountain, Tobi dies. His mother, Oka, becomes very mad at Toklo for not telling her that Tobi was going to die. After Tobi’s death, Oka ignores Toklo and sends him away. On his journey he meets another grizzly cub, and travels with him. Kalik is a polar bear and she also has a younger brother named Taqqiq. On their way to land during summer, Kalik’s mother, Nisa, is eaten by a killer whale, Kalik and Taqqiq are still alive but were separated. Kalik managed to get to the land, and tried to find Taqqiq. He is also tries to find the brun-sky gathering place, the place where all the polar bears meet while summer melts the ice. When he makes it to the burn-sky gathering place, he does not find Taqqiq and continues on. Lusa, the black bear has spent her whole life in a zoo. One day, the humans brought in a another grizzly bear, and Lusa wanted to get to know her. The grizzly turned out to be Toklo’s mom, Oka. Oka told her about what happened with Toklo, and wishes she did not abandon Toklo. Lusa promised to find Toklo and tell him that Oka still cares. Lusa escapes the zoo and goes into the wild to find Toklo. She faces many dangers and must learn to find food on her own. This book made me realize how real animals live and interact with each other in the wild. It also shows people what global warming has been doing to the animals that share the world with us. 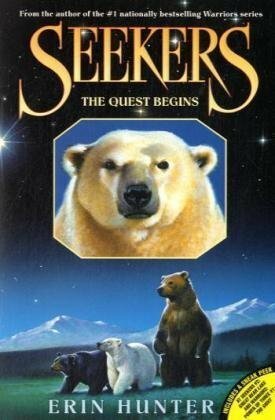 It was unique how the author separated each bears’ story by dividing the book into sections. I especially liked this style of writing because it allows the reader to see each bears’ point of view. My favorite bear is Lusa because she has a sense for adventure, and she will do anything to fulfill a promise. If I were to suggest this book to any age groups, I would recommend ages nine to fourteen. Since I am critiquing this book, I would rate it nine out of ten stars. I would not rate it ten stars because not everything was well explained. They did not connect the previous chapter with the next chapter very well. If I could, I would re-read the book many times because I enjoy reading about wildlife. 1. Why did Kalik, Taqqiq, and his mother have to stay still while waiting for a seal to breath at the watering hole? 2.How did Lusa end up in the zoo? 3. Why does King (Lusa’s dad) hate the zoo? 4. Why does Toklo hate his brother, Tobi? 5. How did Kalik’s mother die? 6. Why did Oka tell Toklo to go away? 7. Why is Oka always upset while she was in the zoo? 8. Why is Lusa so curious about Oka? 9. How did Kalik know he was in the gathering place? 10. How did Toklo learn how to fish? 11. Why did Lusa leave the bear bowl and how? 12. Why did Toklo choose to help the cub? 13. Where did Kalik end up after a no-claw poked her? 14. How did Lusa escape from getting eaten by a brown bear? 15. Why did Toklo not kill the mountain goat?